What if your lamp and laptop could be powered by plants? Biophotovoltaics‘ Moss Table is an innovative furnishing that demonstrates the future potential of Bio-Photo-Voltaic (BPV) technology. Here electricity is generated from the electrons captured by conductive fibers inside the moss table. The technology turns energy that would otherwise be wasted in the photosynthesis process into power that can be put to practical use. 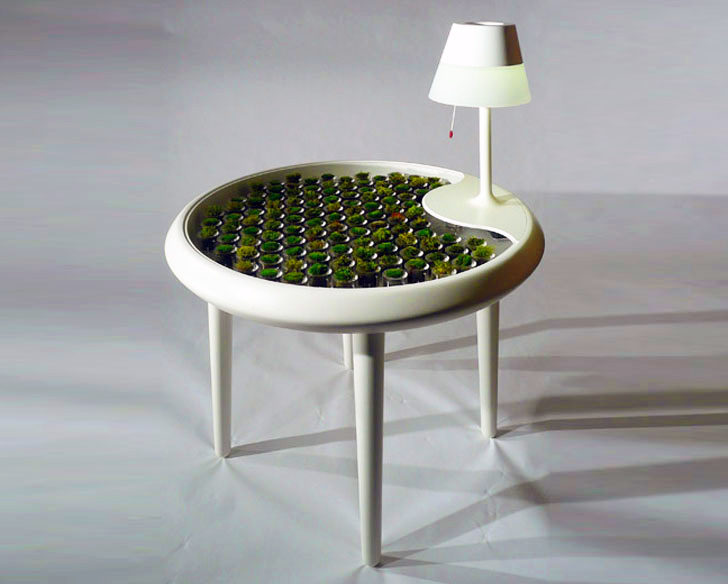 The ‘moss pots‘ in the table act as bio-electrochemical devices converting the chemical energy into electrical energy using biological material such as algea, cyanobacteria, and vascular plants. The ‘Moss Table’ is still in its concept stage, but it can already produce enough electricity t0 power smaller devices such as digital clocks. Scientists are predicting that future BPV devices will be able to power larger devices such as lamps and even laptops. 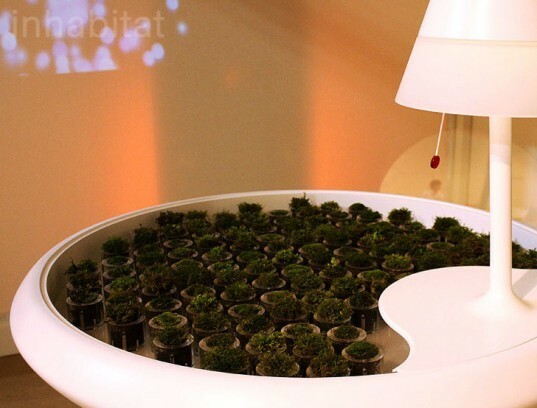 ‘Moss Table’ is being used to spread BPV research to a wider audience, and is part of a larger research project called ‘Design in Science’ exploring ways for design and science to meet. Unfortunately I see this more as an oddity rather than in technology that can be useful if developing the solar power industry. To prove my point, nowhere in the article is the price of such a table mentioned, no doubt because it would be so expensive as to make it impractical. Cool, but suffers from the same storage problem most alt energy suffers from. Be great if a non - battery storage system was worked into the table (I\\\'m thinking non - battery to avoid toxicity usually associated with battery disposal). Maybe a micro gen to compress air into the legs when there is surplus energy? and RM LaFleur - YES! finally a green wall that DOES SOMETHING since green walls barely sequester carbon (most leaves as plant wastes, and unless buried, just decay and release carbon right back or produce oxygen, or even produce the odd berry to delight passerbys. awesome! I hope we use more eco-friendly, alternative stuff in our lives. Genial!! Ojalá pudiéramos replicar en casa. Very cool, now do that to front yards all over the country. Awesome concept, but probably not maintenance free and not practical as a table since putting something on the table will block the light and thus reduce the power output. However I can envision this working with the average lawn to provide supplemental household power. Landscapers could sell sod panels with the electrodes already in place and just hook them up to a grid of low voltage wires. Why not name algea table? Moss is a plant that is facing extinction so probably not the best name to promote an environment friendly idea. What if your lamp and laptop could be powered by plants? Biophotovoltaics' Moss Table is an innovative furnishing that demonstrates the future potential of Bio-Photo-Voltaic (BPV) technology. Here electricity is generated from the electrons captured by conductive fibers inside the moss table. The technology turns energy that would otherwise be wasted in the photosynthesis process into power that can be put to practical use.